One day, during a regular functionality and proof of design check, electronics engineer Lock Chee Seng was confronted with row upon row of questionable printed circuit boards (PCBs). Some worked perfectly, while others overheated when the motor driver switched on. As a professional troubleshooter for Hewlett Packard (HP), Lock knew he had to isolate the problematic PCBs before they were installed into prototype printers. Looking after HP's reputation is always foremost on Lock's mind. His involvement in new products, from introduction to lab prototyping and finally mass production, propels him across an entire spectrum of manufacturing. Tasked to ensure that the prototype printers hit the production floor within a stipulated period of time, he needed to find the problem, analyze it and rectify the dilemma fast. "We have a design review after each prototype is built, to identify, rectify and resolve all issues before the final mass production stage." With the overheating boards, Lock had to verify whether it was a firmware bug, a chip's build matrix gone awry, or perhaps simply a process deviation in the PCA assembly factory. "We knew that some, but not all, of the first prototype batch had a temperature problem. Our printers have a thermal protection scheme that will shut down once over-heated, and some just simply shut down," said Lock. He estimated that of the total initial batch, some 25 percent were affected. "We touched the surface of the motor driver chip on the PCBs and knew that the temperature was too high. But we didn't know just how high, or which ones were flawed, unless we put our already singed fingers to the boards," he said. He recognized it was a motor driver chip on the PCBs that was overheating, but he had two different vendors worldwide supplying the chips. That made it a batch-related issue - the question was, which vendor? He needed a more accurate way to assess the problem and validate his assumption before asking for a re-submission from the suspect vendor. Lock recalled a non-contact thermal imaging device he had seen demonstrated during his product knowledge transfer course at the HP Design Center in Washington State, US during January 2006. He contacted Fluke's Asia Pacific office for assistance and, the rest as they say, is history. 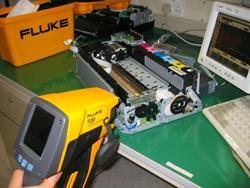 Using a Fluke Ti20 Thermal Imager, Lock was able to isolate the faulty boards. "Chip standard on these boards is a big concern for us as they are used for different printer models," said Lock. He added: "We pointed the thermal imager at the boards and were able to spot the faulty ones immediately." The imager's point-focus-pull trigger operation made detecting the hot spots efficient, while the large, color LCD screen displayed the images for on-the-spot discussions and analysis. 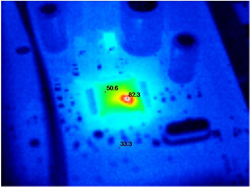 Surprised that the temperature recorded on the chip surface of problem boards registered a high of 169.6°C (337°F), he compared this to a known-good-board with a median temperature of 70°C (158°F). Using the thermal imager to weed out the rejects, he conducted a series of same time runs on a sample batch. At time 0, he produced a start 1 image on the motor driver chips, and 10 seconds later, recorded a second image. He used the imager to determine the absolute surface temperature at the different stages of the test, store the images and compare two spot measurements against each other. As each vendor had different date codes on the chips, helping him isolate the supplier at fault. "With the collected data and recorded comparisons between the faulty chips and good chips, we could now ask the vendor to analyze, rectify and re-submit the PCBs," said Lock. Lock's team is purchasing the thermal imager for ongoing troubleshooting. "Because of the area focal point, we can detect hot spots with one glance." 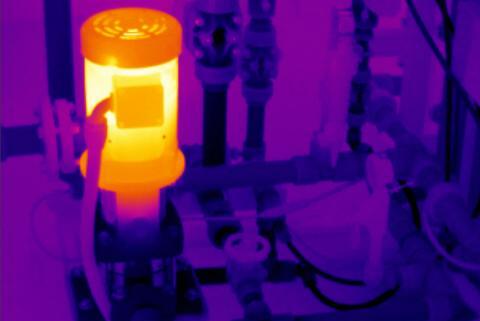 The T120 Thermal Imager measures up to 350°C (662°F) and, with the accompanying recording software, allows him to identify peak values. Portability influenced his choice of imager. Designed for field conditions, the 1.2 kg Ti20 is "light enough to use in one hand," he says. He also liked the lens. It provides accurate temperature readings from 20cm away, and "the focus is easy to adjust, much like a digital camera." Lock used the accompanying software to create a report on his thermal studies and route the information to those concerned in the office. 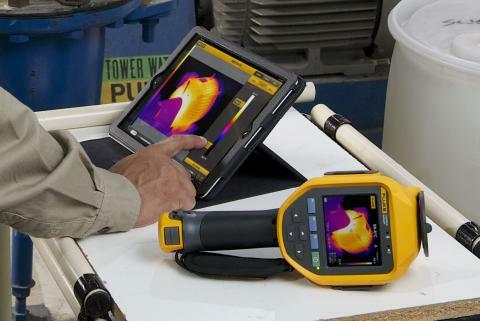 "I envison that more such thermal imagers will be used for maintenance and troubleshooting in our line of work. An analysis can be done on the spot, scanning known-good-boards for comparison, the images can then be re-exported for comparison." When fully charged, the unit offers three-hours of battery life. It also runs using an ac power adapter, a rechargeable battery pack, or six AA batteries. With room to store about 50 images internally, the Ti20 offers Lock sufficient digital space for a full day of inspections in the field. "I find that it is a necessity, a must-have diagnostic tool essential for electronics work. Suitable for predictive maintenance and troubleshooting, the thermal imager provides another dimension in our line of work."